Wallace Stevens and the Actual World (Princeton University Press, 1991), 350 pp. Secretaries of the Moon: The Letters of Wallace Stevens and Jose Rodriguez Feo, with Beverly Coyle (Durham: Duke University Press, 1986). Selection of essays published in Jacket2 in 2011-12: "To Keep You from Going: Notes toward a Definition of Modernism," April 21, 2012. "1974 Larry Eigner Recordings," March 23, 2012. "Know What Is Happening in Your Heart: Robert Penn Warren's Racism," February 10, 2012. "Learning, Not Teaching," February 3, 2012. "Gil Ott and Charles Alexander after 9/11," January 29, 2012. "Experiment is Exhausted and So It's Time to Interpret Rather than Explore: Louise Bogan's Cold War Anti-Modernism," January 9, 2012. "Return to the Tapeworm Factory: The Conceptualism of Darren Wershler-Henry," December 18, 2011. "Mere Alphabetic Adjacency: David Buun's Card Catalogue Art," November 23, 2011. "When the Right Thought of Itself as Poetry & the Left as Prose," November 2, 2011. "Wallace Stevens of the New York School," in Wallace Stevens, New York & Modernism, ed. Lisa Goldfarb, Bart Eeekhout, Routledge, 2012 (forthcoming). "What's Historical about Historicism," Wallace Stevens Journal (Fall 2004). "Kinetic Is as Kinetic Does: On the Institutionalization of Digital Poetry," in New Media Poetics: Contexts, Technotexts, and Theories, ed. Adelaide Morris and Thomas Swiss (Cambridge: MIT Press, 2006), pp. 123-140. "Stevens/Pound in the Cold War," Wallace Stevens Journal 26, 2 (Fall 2002), pp. 181-193; special "Pound/Stevens Revisited" issue, ed. Glen MacLeod. "Some Remarks on the Institutionalization of E-Poetries," NC1 (Spring/Summer 2002), pp. 84-88; part of "New Media Literature: A Roundtable Discussion on Aesthetics, Audiences, and Histories." "On Frets about the Death of the Book", CrossConnect, vol. 1, no. 2 (Fall 1995). "Conflict Seems Vaguely Un-American": Teaching the Conflicts and the Legacy of Cold War", Review, volume 17 (1995), pp. 156-71. "'This Posture of the Nerves': Modernism's Partisan Center," Journal of Modern Literature 18, 1 (Winter 1992): 49-64. "Stevens, 'J. Ronald Lane Latimer,' and the Alcestis Press," Wallace Stevens Journal 17, 2 (Fall 1993), 180-202. "Modernism from Right to Left: Stevens, Radicalism, and the 1930s" [chapter 2, part 1 of the book bearing that title], George Arent Library Courier 27, 2 (Spring 1992), 3-23. "'Beyond the Rhetorician's Touch': Stevens's Painterly Abstractions," American Literary History, Spring 1992, 230-63. "Stevens's Home Front," Wallace Stevens Journal 14, 2 (Fall 1990), 99-122. "Still Life without Substance: Wallace Stevens and the Language of Agency", Poetics Today, "Art and Literature" issue, ed. Wendy Steiner 10, 2 (Summer 1989), 345-72. "Voicing the Desert of Silence: Stevens' Letters to Alice Corbin Henderson," Wallace Stevens Journal 12, 1 (Spring 1988), 3-20. "Wallace Stevens and the Strength of the Harvard Reaction," New England Quarterly 58 (March 1985), 27-45. "Wallace Stevens and the Crisis of Authority," American Literature 58 (December 1984), 560-78. Interview with Joan Retallack, on relations between innovative poetry and experimental teaching (February 28, 2001). Interview with Tony Kushner (February 12, 2001). "Wideman on Campus," interview with John Edgar Wideman conducted by Alan Filreis and Lorene Cary, April 24, 2000, The Pennsylvania Gazette, July 2000. Interview with Robert Creeley (April 11, 2000). Interview with Grace Paley (February 15, 2000). "A Conversation with Howard Fast, March 23, 1994, Conducted by Alan Wald and Alan Filreis," Prospects: An Annual of American Culture Studies, vol. 20 (1996), pp. 511-23; re-published in Contemporary Literarary Criticism 131 (Summer 2000). Interview with Edwin Torres (December 11, 1999). Review of Harold Kaplan, Poetry, Politics and Culture, Wallace Stevens Journal 30, 2 (Fall 2006), pp 235-36. "Where Survival Is at Stake," review of Frederick Busch, A Memory of War in the New Leader, November-December 2002, pp. 50-52.
Review of Cary Nelson, Revolutionary Memory: Recovering the Poetry of the American Left (Routledge, 2001), Modernism/Modernity, Fall 2002.
Review of Modernism, Inc: Body, Memory, Capital, eds. Jani Scandura, Michael Thurston (NYU, 2002), Against the Current, September 2002, pp. 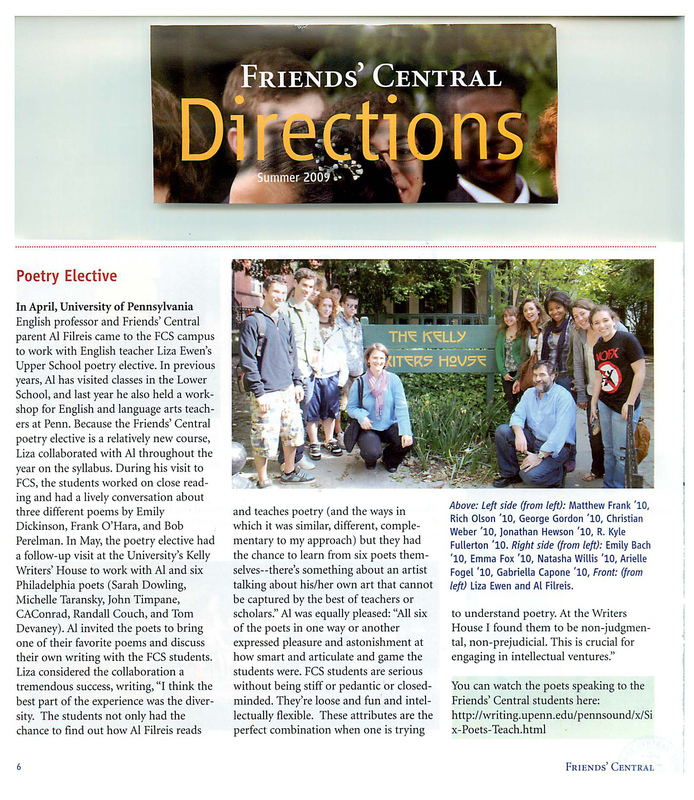 100-103.
Review of Marjorie Perloff, Poetry On & Off the Page, in "Breakthrough Books," Lingua Franca, January 2000. Reviews of David Jarroway, Wallace Stevens and the Question of Belief: Metaphysician in the Dark (1993) for American Literature and The Wallace Stevens Journal. Untitled review of William W. Bevis, Mind of Winter: Wallace Stevens, Meditation, and Literature (1988), American Literature (June 1990). "The Problems of Biography," review of Milton Bates, Mythologies of Self (1985), Virginia Quarterly Review 62 (Summer 1986), 543-47. "Stefan Sagmeister's Happiness Project," essay co-written by Robert Chaney, interim director of Institute of Contemporary Art, Philadelphia, for Stefan Sagmeister, 36 Difficult Questions for Stefan Sagmeister (ICA, 2012) pp. 10-13. "Covici-Friede," in American Literary Publishing Houses, 1900- 1980, ed. Peter Dzwonkoski (Detroit: Gale, 1986), pp. 92- 97. "Cold War Poetics," Franklin & Marshall College, Writers House/English Department, March 10, 2010. "Wallace Stevens as New York School Poet," paper delivered at the "Wallace Stevens, New York & Modernism" conference, Gallatin School, New York University, March 5, 2010. "The Rago Era at Poetry," Regenstein Library, University of Chicago, April 2010. "The Radical Poetry of New York City," Gotham Center for New York City History, CUNY Graduate Center, May 4, 2006. A series of related talks on the politics of writing and the university at the University of Michigan co-sponsored by the College of Literature, Science & Art, the MFA Program of the English Depaetmwnt, the Sweetland Wroting Center, and the Alice Lloyd Hall Scholars Program, October 6, 2005. "Modernism and Anti-Communism," English Department, Pennsylvania State University on October 18, 2004. "Red Blue Guitar: Why Can't Modernism and Communism Get Along," Poetics Program, SUNY Buffalo (hosted by Susan Howe) on September 22. "Magic thinking, unmediated access, instant solutions--not," Wayne State University, April 13, 2001. "Poetry, Community and the Academy: Clearing a Space," paper given at "Poetry Communities & the Individual Talent" conference, April 12, 2012 (paper to be published later). "Emily Dickinson on Isolation," Kelly Writers House, "Seven Up in Isolation," March 8, 2012. "On Primo Levi's 'Iron' and 'Carbon," Kelly Writers House, Jewish Writers Symosium, February 17, 2012. "The Poetics of the Modernist Dead End," American Literature Association Conference, Boston, May 22, 2009. "Sound in Stevens," MLA, December 2006. "Text & University: Working against Conventions of Reading & Listening" International Association of Word and Image Studies: Elective Affinities conference, September 23-27, 2005, for a panel entitled "VVV-on-line: Verbal-Visual-Vocal Poetries in Hyperspace." MLA conference, in December 2004, organized, chaired and participated in a panel on "Stevens in Contemporary Poetics" with Susan Howe, Charles Bernstein, and Peter Gizzi. Keynote speaker, "New Media Poetry: Aesthetics, Institutions, and Audiences" conference sponsored by The International Writing Program, the English Department, and the Project on Rhetoric of Inquiry of the University of Iowa, October 10-13, 2002: "On the Institutionalization of E-Poetries"
Washington Post article about text messaging, Sunday, February 22, 2009, page 1. "Influences: What Shapes the Minds that Make the News," profile in The Philadelphia Inquirer, Sunday, January 28, 2007, p. C2. "Professor Establishes Repository for iPod Poetry", Chroncile of Higher Education, January 21, 2005. For 1999-2000 - University of Pennsylvania Research Foundation Grant, "Anticommunism and Poetry"
For 1996-97 - University of Pennsylvania Research Foundation Grant, "The Literature and Culture2 of the Cold War, 1945-60"
For 1995-96 - Center for Community Partnerships Program Grant, "Teaching the Holocaust as a Model for High School-University Partnerships"
Member, School of Liberal and Professional Studies Executive Committee, 2010-present. Founding Teacher/Scholar, Innovative Study in Teaching and the Humanities (ISTAH), a program designed to "support and develop communication and collaboration between secondary school teachers at urban high schools and scholars at Penn"
Member of the Board of Spoken-Web 2.0 Digital Humanities Project, Concordia University (Canada). Appointed by Mayor Nutter to serve as member of 4-person committee to create Phialdelphia Poet Laureateship and then to appoint the first recipient, 2011-12. Member, editorial board for MAPS, the American literature web site sponsored by Cary Nelson and the University of Illinois and Anthology of Modern American Poetry, Cary Nelson, editor (Oxford University Press, 2000), 1247 p.
Member, Editorial Advisory Board, CrossConnect. My involvement is described in Tom Harper's 'CYBERSPACE LITERATI CHALLENGE "BIG DOGS"' (CrossConnect, 2, 1 (1996). "Collecting the Unconscious" conference sponsored by the Graduate Humanities Forum, faculty respondent to a panel on early American literature, March 3, 2005. "The Internet & Universities", November 1995. "Representations of the Holocaust in Literature and Film", part of the College of Arts & Sciences "pilot curriulum," co-taught with Millicent Marcus of Italian Studies, Fall 2000, 2001, 2002. "The History of the Novel"
"Modern American Poetry: Whitman, Dickinson, Stevens, Williams"
"Group Independent Study: Postmodernism across the Disciplines"
"Group Independent Study: Lit. & Propaganda Theory"
"Group Independent Study: The Idea of the University"
"Group Independent Study: Writing, Editing, Printing, Publishing, and the Writing Community"